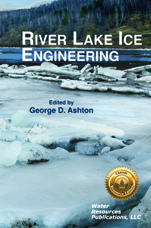 River Lake Ice Engineering grew out of a need for a single, introductory source for the general principles for engineering applied to river and lake ice problems. Ice affects all of us, often in ways that we are only beginning to perceive or understand. In northern countries ice represents an environmental hazard that can endanger human lives and influence human activities such as industrial production, transport of goods, housing, building, and winter sports. The goal of ice engineering is to protect human life and property against the harmful effects of ice. Even though the topics in this book do not directly address sea ice, however much of the content may be applied to problems involved with saline ice. This book has been an excellent edition to many engineering libraries, an informative source to consultants, as well as an essential textbook for introductory courses on river and lake ice engineering. It is now part of WRP’s Classic Resource Edition.